This guidance advises on a very important reconciliation setting in KashFlow. If you have previously reconciled your statement up until a certain date (usually this is the case if you have moved over to KashFlow from another accountancy software) then you can specify a Reconcile Date. The reconcile date is the date that you’ve previously reconciled up until and means that when you begin your first reconciliation the start date will be the day after the date set here. 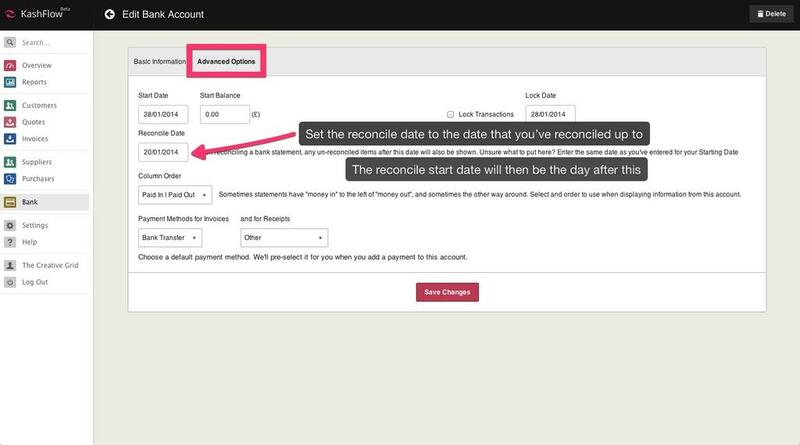 You can set a Reconciliation Date by going to Bank > click the Pencil icon next to the account that you would like to specify a reconciliation date for > advanced options and using the Reconciliation Date field enter in the date that you have reconciled until. When you’re done just click Update.